TWIN 1731 is designed by the internationally acclaimed designer Matteo Thun. Years of work culminated in the ZWILLING wedge geometry that improves comfort and optimizes cutting technique. This innovative curved bolster is meant to be an extension of the hand, supporting the professional grip with thumb and index finger on the bladeDeveloped for bearings in aerospace engineering, the highperformance Cronidur 30 steel boasts impressive toughness and corrosion resistance that is 100 times higher than standard steel. 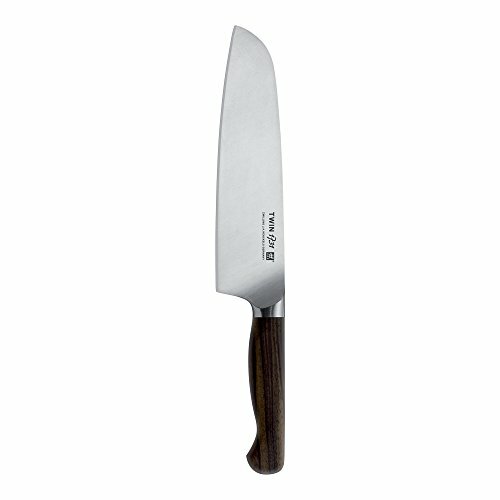 Combined with ZWILLING's signature ice-hardening technique, this FRIODUR blade is exceptionally sharp and durable.Each knife is precision-forged with ZWILLING's SIGMAFORGE process, resulting in a remarkably sturdy, balanced and flexible blade. With an incredibly sharp, laser-controlled edge, the knives are honed and hand-finished by the most skilled artisans. If you have any questions about this product by Zwillilng J.A. Henckels, contact us by completing and submitting the form below. If you are looking for a specif part number, please include it with your message. CUTCO Model 2166 Petite Santoku Knife......... 5.6" High Carbon Stainless Straight Edge blade..............5.1" Classic Brown handle (sometimes called "black")................. in factory-sealed plastic bag.